This combination is useful in people having low blood calcium levels; who do not get enough calcium from their diets. Calcium is necessary for many normal functions of body, especially bone formation and maintenance. 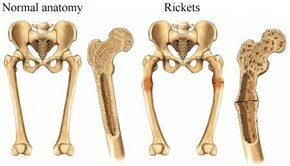 Low blood levels of calcium may cause bone disease. Thus this combination helps in maintance of calcium & healthy bones. Calcitriol is a synthetic vitamin D analog which is active in the regulation of the absorption of calcium from the gastrointestinal tract and its utilization in the body. It is the active form of the vitamin D3. It is useful in low levels of calcium in the blood of patients whose kidneys or parathyroid glands (glands in the neck that release natural substances to control the amount of calcium in the blood) are not working normally. 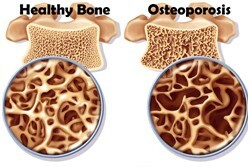 Low blood levels of calcium may cause bone disease. Calcium Citrate is calcium salt of citric acid. Calcium salt can be used in the prevention of calcium deficiency states. It is also used as an adjunct in the prevention of osteoporosis. Methylcobalamin is the neurologically active form of the vitamin B12 and has strong effect on the brain and nervous system being also very important for cell growth and production. Methylcobalamin is used in variety of processes, including: production of red and white blood cell, the regeneration of RNA and DNA, synthesis of proteins. It is useful in vitamin B12 deficiency, psoriasis, pernicious anemia & atopic dermatitis. Cholecalciferol is a fat soluble vitamin D3. Vitamin D is important for the absorption of calcium and phosphorus. Having the right amount of vitamin D, calcium, and phosphorus is important for building and keeping strong bones. 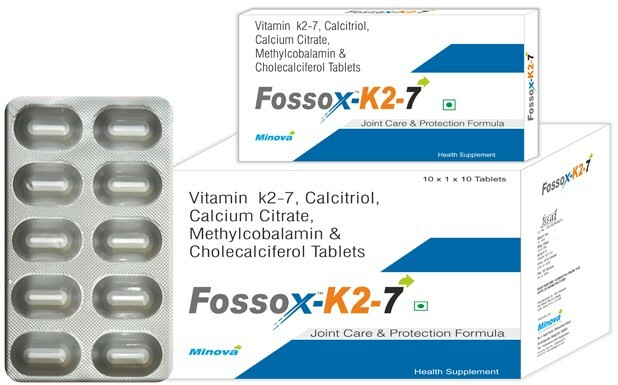 Vitamin K2-7 is essential for the body to utilize calcium. There are two types of naturally occurring forms of vitamin K, phylloquinone and menaquinones. Phylloquinone (vitamin K1) is the major type of dietary vitamin K, while menaquinone-4 (vitamin K2) is the major form of vitamin K in the tissues, including bone. Calcitriol: The two known sites of action of Calcitriol are intestine and bone. Calcitriol may also act on the kidney and the parathyroid glands. Calcitriol is the most active known form of vitamin D3 in stimulating intestinal calcium transport. Calcitriol, in conjunction with parathyroid hormone, stimulates resorption of calcium in bones while in kidney; it increases the tubular reabsorption of calcium. Methylcobalamin: as we age our body's ability to methylate declines, contributes to the aging process. Methylcobalamin functions as methyl donor. Folate is involved in neurotransmitter synthesis and critical enzymatic reactions throughout the body. By depleting excess homocystine, folate benefits cardiovascular health and nervous system function. Cholecalciferol: It helps in absorption of calcium. The most important function of vitamin D3 is its effect on bone growth, density and structural integrity. This vitamin is needed for proper integration of calcium and phosphorous to make strong, healthy bones. Vitamin K2-7: Vitamin K functions in the post-translational modification of a number of vitamin K-dependent proteins such as osteocalcin, a bone protein containing gamma- carboxyglutamic acid. This protein is involved in calcium uptake and bone mineralization. Calcitriol:Calcitriol is rapidly absorbed from the intestine. Peak serum concentrations were reached within 3 to 6 hours following oral administration. Methylcobalamin: Peak plasma concentrations after 3 hr (oral); 0.9 hr (IM); 3 min (IV). Cholecalciferol: Well absorbed from the GI tract. Vitamin K2 is part of a family of structurally similar fat-soluble, 2-methyl-1,4-naphthoquinones that include phylloquinone (K1), menaquinones (K2), and menadione (K3). Vitamin K1 is absorbed from the gastrointestinal tract in the presence of bile salts and pancreatic lipase. Once absorbed, vitamin K accumulates in the liver, spleen, and lungs, but significant amounts are not stored in the body for long periods. The pharmacokinetics of supplemental vitamin K2 is not yet clearly understood, although its clinical efficacy is evident. Calcium Citrate:Approx 33% of oral calcium absorbed via active transport and passive diffusive in small intestine. Calcitriol is approximately 99.9% bound in blood. Calcitriol and other vitamin D metabolites are transported in blood, by an alpha-globulin vitamin D binding protein. Cholecalciferol Bound to a specific α-globulin. Slowly released from storage sites & skin where it is formed in the presence of sunlight. Calcitriol metabolized into calcitroic acid through the action of 24-hydroxylase. The second pathway involves the conversion of calcitriol via the stepwise hydroxylation of carbon-26 and carbon-23, and cyclization to yield ultimately 1α, 25R(OH)2-26, 23S-lactone D3. The lactone appears to be the major metabolite circulating in humans. Cholecalciferol Hydroxylated in the liver by the enzyme vitamin D 25-hydroxylase to form 25-hydroxycholecalciferol (calcifediol). Further hydroxylated in the kidneys by the enzyme vitamin D1-hydroxylase to form the active metabolites 1,25-dihydroxycholecalciferol (calcitriol). Further metabolism also occurs in the kidneys, including the formation of the 1,24,25-trihydroxy derivatives. Calcitriol: Metabolites of Calcitriol are excreted primarily in feces. Cholecalciferol: Mainly in the bile & faeces with only small amount appearing in urine. ● Cholestyramine may impair intestinal absorption of Calcitriol. ● Thiazides are known to induce hypercalcaemia by the reduction of Calcium excretion in urine. Concomitant administration of thiazides with Calcitriol may cause hypercalcaemia. ● Concomitant use of Calcitriol with digitalis may increase the risk of cardiac arrhythmias. It should not be given to patients with hyper-calcemia. Pregnancy & Lactation: No well controlled studies are available regarding the use of this combination in pregnancy and lactation. Ask your doctor or pharmacist for advice before taking any medicine.